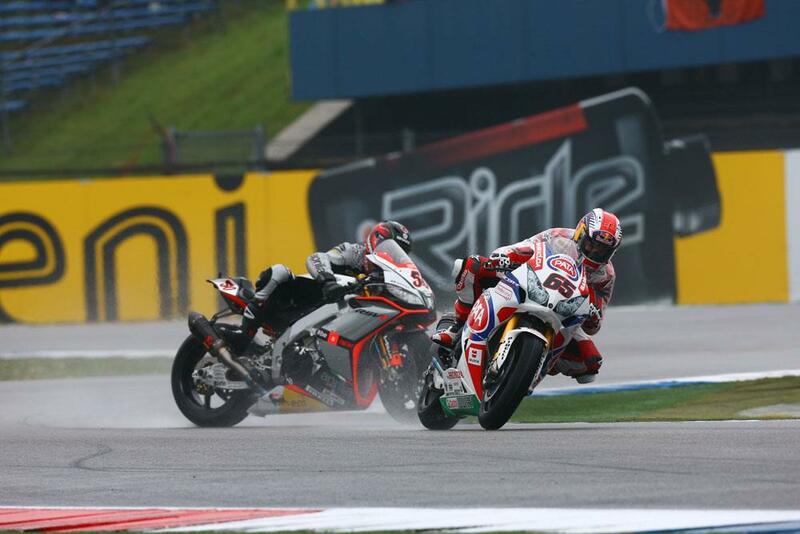 Jonathan Rea has taken a flag to flag victory in a rainswept World Superbike race two at Assen, leading from start to finish in horrid conditions to better his race one podium finish. He initially battled with race one winter Sylvain Guintoli, before the French rider crashing out, eventually managing to come back to ninth. 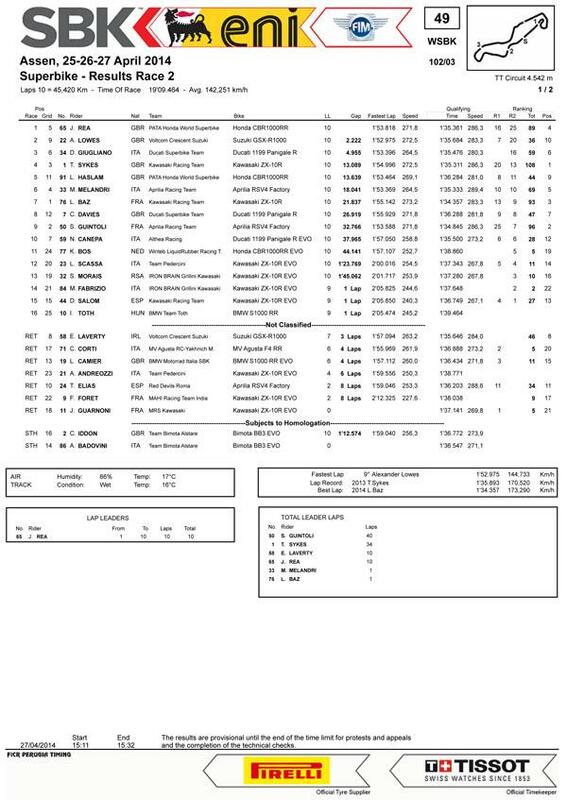 Second was Alex Lowes, with the British Superbike champion claiming his first WSB podium. The rookie fought his way forwards to second, before putting in a series of fast laps in an attempt to close down Rea, but with the race shortened to only ten laps he was unable to find the time he needed. Davide Guigliano was the final podium finisher, battling with Marco Melandri for most of the race before his fellow italian won wide, costing him a number of positions to finish sixth. Championship leader and reigning champion Tom Sykes was fourth, taking a safe finish in the treacherous conditions, ahead of fellow Brit Leon Haslam. Pole man Loris Baz was seventh, with Chaz Davies making it five Brits in the top eight. It was a disastrous weekend for Eugene Laverty, as last season’s runner-up ended the second race the same way as the first, with an unwanted trip to the gravel trap. He was joined by Leon Camier on the BMW Italia Evo bike, as well as Corti, Andreozzi, Elias, Foret and Guarnoni, with only 16 finishers.